Traditionally, wedding dress shopping is done in a wedding dress boutique. The bride-to-be, her mother, and perhaps even a few bridesmaids join in for a day out on the town scouring shoppes for the perfect dress. Even before they’re engaged, most brides have their ideal gowns chosen and are on the hunt for either that exact designer dress or something very similar. Unfortunately (or fortunately for me), I am not traditional in this sense. I never wanted to go to David’s Bridal or a local boutique to shop for my dream dress. Instead, I took to the World Wide Web and found exactly what I was seeking, and for a fraction of the price. I have been on the committee for a local gala for the past four years. Each year I buy a new gown to wear, and I’ve always shopped online. Once through Rent the Runway, once on Azazie, and twice on JJsHouse.com. All three sites I highly recommend for their quality of product and great customer service. Though all of the gowns bought online have been outstanding, I specifically want to praise JJsHouse. JJs was the first online store from which I ever purchased a gown. I read numerous reviews prior to ordering my first gown from this online store, and the majority were high ratings. Wanting to save some cash from buying in-store, I opted to give them a shot — and it was so worth it! I received a beautifully embellished gown made of high quality material and perfect measurements. It is no wonder the site has earned my return service for my bridal gown now. I found my wedding dress in November, and I have been putting off ordering it simply due to forgetfulness. There have been so many other aspects of the wedding I have focused my concentration that the gown sat quietly in an online shopping cart. I wasn’t too concerned though once I finally remembered its existence. JJs has never been anything but speedy in their production and shipping of gowns I’ve ordered over the years. So when I ordered the dress on February 25th (only three and a half months prior to my wedding), I wasn’t worried that it would arrive in enough time to have any alterations completed before June. The dress arrived today, a month after the order was placed. As I picked the package off my front step, I could hardly contain myself as I opened the box and out slipped the dress bag. I moved my fingers meticulously over the material and seams to check their status. Then I took to my bedroom and full-length mirror to see the final outcome. I was enthralled! The dress had high-quality lace and tulle, a built-in bra, boning, and had been custom sized to fit me like a glove. Plus, one of my favorite features of JJsHouse dresses, the gown had a covered buttons on the back which fastened via a hidden zipper. Thus it was an easy-on process! For anyone considering purchasing their bridal gown online, I know there are a lot of horror stories out there when it comes to buying products online. However, I could not be more thrilled with my purchase of my wedding gown, or any of my gowns in the past. You simply have to be realistic and use common sense when it comes to the designer and online store you choose: do your homework, read multiple reviews, and go with your gut on whether a site can be trusted or not. It can be such a cost-effective and convenient solution for the bride-to-be on a budget. I had gone through the traditional boutique for my prom dresses in high school and was still salty towards the price points of which I foolishly chose to buy those gowns. As a wiser and more penny-conscious adult, there was no way I was spending over $500 for a dress I’d wear one day of my life even if my wedding is more momentous than high school prom. I could not stomach the thought when I knew those extra funds could be spent on something else for the wedding instead. My heart happily skipped a beat when I saw the grand total of my wedding dress — which included custom sizing, shipping and handling, and the gown itself — cost only $190. The secret behind shopping online for your wedding gown are simple: be smart and knowledgeable on what you want to purchase. Know your budget, and stick to your budget. You’re looking online for a reason, and that’s so you can spend money on other wedding necessities. Can I get an amen?! Have a vision of how you want to look on your Big Day. I’m sorry girls, buy you will not find a Maddie Sottero or Alfred Angelo in your online budget-cutting hunt. (If you do, then please share with the world!) I suggest finding some designer gowns you admire and starting with similar silhouettes or fabrics for a dress to fit your goals. Measure yourself. Custom sizing may be a little extra charge on some sites, but will cut costs in the long run. Remember seamstresses and alterations can be pricey once you receive your dress, so try to get your sizing as accurate as possible! Leave plenty of time for delivery. Yes, I cut delivery of my dress a lot closer to the wedding date than most brides will. However, I knew the store I was buying my gown and trusted their shipping department. If you’re buying from a new vendor, make sure to give yourself some squeeze time just in case shipping takes a bit longer than stated or alterations do need to be made to the dress. In the end, remember to have fun with your shopping as well! I am not a fan of shopping in general, so going to a boutique just didn’t sound like a productive way to spend my time. (Something about the fake salespeople and high price tags, I guess.) 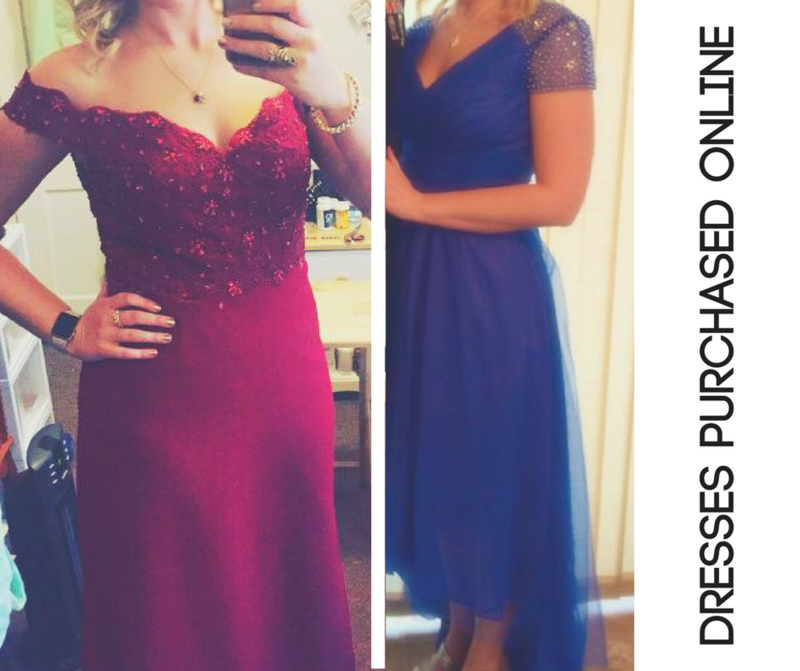 Yet I could look online at dresses all day — and did until I found my perfect fit! Enjoy this time and the process of finding the right gown for you.